This species is endemic to Lake Tanganyika. 36″ x 12″ x 12″ (90x30x30cm) – 80 litres as a group should be kept. Should be housed in a Lake Tanganyika biotope setup, with piles of rocks arranged to form caves and areas of open water for swimming. Dim lighting will encourage the fish to be seen more often. Synodontis are omnivorous and are most unfussy in terms of feeding. Frozen, live and dried foods are all accepted. It also relishes vegetable matter in the form of shelled peas, cucumber etc., which it will rasp at with the teeth in its lower jaw. Should not be kept with any fish so small as to be considered food but makes a good addition to a community of hard water cichlids, ideally mouthbrooding species of Rift Lake origin. It can also be kept with suitably sized rainbowfish and livebearers. The dwarf form can be kept with many different species due to its adaptability regarding water chemistry (see below). Both forms should be kept in a group of 4 or more as single specimens are often very secretive. One of the most peaceful species of Syno available. Mature females are rounder in the belly than males. Cannot be sexed using the genital papillae technique as it is too small. Unlike the majority of the genus, S. petricola is actually bred quite often in aquaria. It is usually an open spawning egg scatterer but it is also one of the few fish known to exhibit a method of spawning known as brood parasitism. 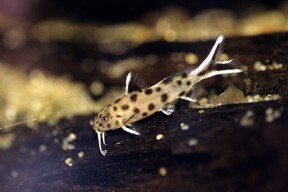 The others also being Tanganyikan Synodontis species! The catfish times its spawning to coincide with that of a ‘host’ mouthbrooding cichlid and lays its eggs among those of the host fish. 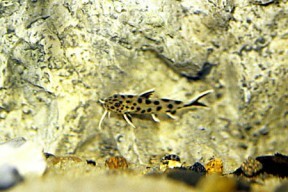 The Syno eggs hatch much quicker than the cichlids’ and the young catfish quickly devour all the mouthbrooder’s eggs. The unwitting cichlid then guards the fry as if they are their own. However, in aquaria by far the most productive method of breeding is to set up a separate breeding tank and try and raise all the eggs. The tank can be quite simple but should contain hiding places in the form of rock piles or terracotta pots. Water should be kept very clean with minimal nitrates. The fish can be spawned in pairs or groups (flock spawning) and whichever method is used, they should be brought into condition with plenty of live and frozen foods. Spawning itself occurs following some chasing by the male. 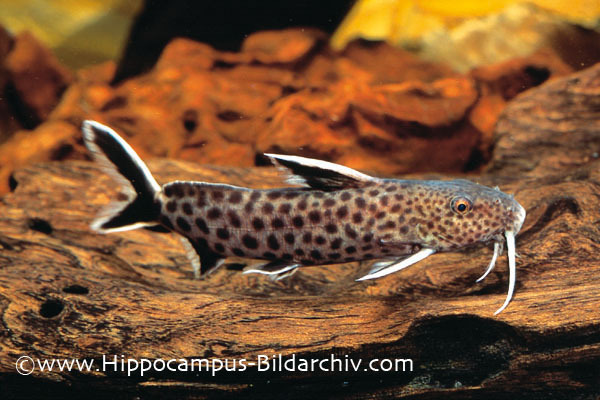 The fish adopt a similar stance to the “T” position seen in Corydoras breeding. The male grabs the female around the head area and eggs and sperm are released. They may also be seen lying alongside each other, quivering as spawning takes place. The adult fish should be removed once the spawn is complete in order to avoid egg predation. The eggs hatch in around 24 hours with the fry becoming free swimming 2-3 days later. They are very small and should be offered infusoria for the first couple of days, followed by brine shrimp nauplii and powdered flake. They are fairly slow growing and it may take 6 months or more before they reach a saleable size. There are also reports of S. petricola spawning in caves so it is obviously unfussy with regards to breeding, provided conditions are to its liking. One of our favourite Synos and highly recommended for any Tanganyikan community aquarium. The dwarf form can even be kept in a South American community.